Configuration management (CM) is a governance and systems engineering method for guaranteeing compatibility among physical and logical assets in an operational background. Chef, Ansible, Puppet, etc. are the best available tools to automate infrastructure configuration or management. Chef is the tool utilised for Configuration Management that is a close counterpart of Puppet. I would like to describe What is Chef, its Configuration Management and how Chef gains Configuration Management here in this blog. Chef is a sturdy automation platform that turns infrastructure into code. It doesn’t matter you’re working in the Cloud, on-premises, or in a hybrid environment, Chef is used to automate infrastructure configuration, deployment, and management over your network regardless of its size. Chef is written in Ruby and Erlang that gives a way to define infrastructure as a code. Infrastructure as code (IAC) implies to maintaining infrastructure by writing code (automating infrastructure) rather than doing manual processes. It is also specified as programmable infrastructure. Chef applies a pure-Ruby, which is a Domain Specific Language (DSL) for writing system configurations. Similar to Puppet which possesses a Master-Slave architecture, even Chef has a Client-Server architecture. However, Chef has an additional segment called ‘Workstation’. With the configurations in the server, the Nodes are dynamically renewed in Chef. This is termed as Pull Configuration which indicates that we don’t want to perform even a single command on the Chef server to launch the configuration on the nodes; the nodes will automatically update themselves with the arrangements in the Server. 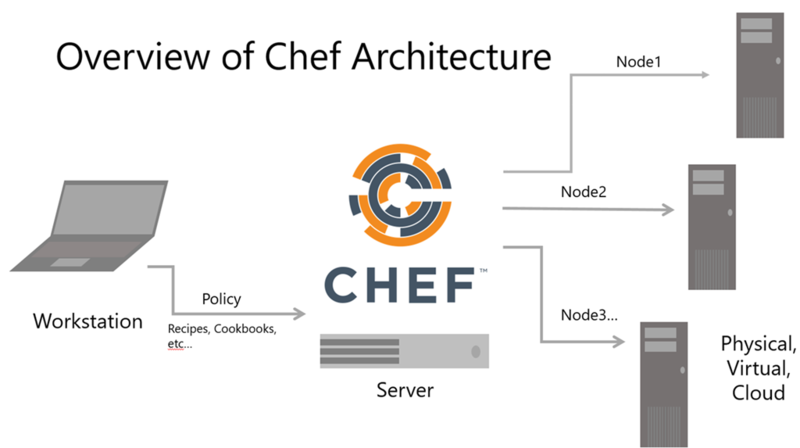 Chef runs with three core segments they are Chef server, workstations, and nodes. The Chef server is the heart of Chef operations where modifications are saved for an application. The Workstations are static computers or virtual servers where all code is made or modified. There can be as many workstations as required, whether this is a single individual or otherwise. Ultimately, nodes are the servers that want to be executed by Chef, these are the systems that modifications are being pushed to, usually a line of multiple machines that need the advantages of an automation program. These three components interact in a straight manner, with any settings being pushed from workstations to the Chef server, and then pulled from the server to the nodes. In return, data about the node transfers to the server to decide which files are distinct from the current settings and need to be updated. The Chef server is the principal mode of transmission within the workstations where your infrastructure is coded, and the nodes where it is deployed. Each configuration file, *cookbook (explained later), metadata, and other information are collected on the server. The Chef server also retains information concerning the status of all nodes when the last Chef to client run happens. All changes performed need to pass through the Chef server to be deployed. Advance to taking or driving changes, it checks that the nodes and workstations are paired with the server through the use of authorization keys, and then grants for communication connecting the workstations and nodes. The Bookshelf is a container where cookbooks are saved on the Chef server and it is ‘versioned’. When a cookbook is uploaded to the Chef server, the latest version is checked with the older one. In case there are changes, the new version will be stored. The Chef server stocks a single copy of a file or template which implies if resources are shared among cookbooks and cookbook versions; they will not be stored many times. Workstations are the place where users build, test, and maintain cookbooks and policies that will be pushed to nodes. Cookbooks formed on workstations can be used individually by one party or can be uploaded to the Chef Supermarket for others to handle. Likewise, workstations can be utilised to download cookbooks designed by other Chef users and discovered in the Supermarket. Workstations are established to use the Chef Development Kit (ChefDK) and can be found on virtual servers or on real workstation computers. Workstations are also arranged to communicate with only one Chef server, and most work will be performed in the chef-repo directory placed on the workstation. The chef-repo directory is the particular area of the workstation where cookbooks are authored and sustained. The chef-repo is regularly version-controlled, most often by the use of Git, and stores information and history that will be applied on nodes, such as cookbooks, environments, roles, and data bags. Chef is capable to interact with the server from the chef-repo and push any modifications via the use of the knife command, which is involved in the ChefDK. The knife command transfers between the chef-repo found on a workstation and the Chef server. A node is a system configured to operate the chef-client. There is no restriction in choosing any system as long as it is being managed by Chef. Nodes are verified through the validator.pem and client.pem certificates that are conceived on the node when it is bootstrapped. Nodes are kept updated through the advantage of the chef-client, which operates a convergence within the node and the Chef server. Cookbooks are the major component of configuring nodes on a Chef infrastructure. Cookbooks have values and data about the desired state of a node, not how to get to that state. Chef does all the task for that through their large libraries. Cookbooks contain components like recipes, metadata, attributes, resources, templates, libraries, and everything that supports in conceiving a functioning system, with attributes and recipes being the two core parts of building a cookbook. Components of a cookbook should be modular, having recipes that are small and similar. Cookbooks should be version checked. Versions can benefit when using environments and allow for the easier tracking of modifications that have been done to the cookbook. Recipes are a significant part of cookbooks. Recipes are written in Ruby and hold information regarding everything that needs to be worked, changed, or formed on a node. Recipes work as a set of resources that define the configuration or policy of a node, with sources being a configuration element of the recipe. For a node to operate a recipe, it must be on that node’s run list. Attributes determine particular values on a node and its configuration. These values are utilised to override default settings, and are loaded in the order cookbooks are arranged in the run list. Often attributes are used in combination with templates and recipes to limit settings. Here files mean static files that can be uploaded to nodes. Files can be configuration and setup files, scripts, website files or anything that does not need to have separate values on various nodes. Although Chef comes with a number of libraries as default, extra libraries can be set. Libraries are what make recipes to life: If a recipe is the desired state of a node, then added libraries comprise the behind-the-scenes information that Chef requires for the nodes to arrive this state. Libraries are written in Ruby, and can also be applied to expand on any functionalities that Chef previously contains. Templates are Ruby files (.erb) that are embedded which allow the content based on the node itself and other variables made when the chef-client is operated and the template is used to build or update a file. Providers and resources are also applied to describe new functionality to use in Chef recipes. A resource outlines a set of operations and properties, whereas the provider notifies the chef-client on how to perform each action. Chef was formerly developed for Linux, but now backs a lot of other Operation Systems like AIX, RHEL/CentOS, FreeBSD, OS X, Solaris and Microsoft Windows. Also, further client platforms comprise Arch Linux, Debian and Fedora. Chef can stand integrated Cloud-based programs, for instance, Internap, Amazon EC2, Google Cloud Platform (GCP), OpenStack, SoftLayer, Microsoft Azure and Rackspace to automatically reserve and configure the latest computers. It is an intense, sharp and actively growing community favourite. Due to Chef’s capability and versatility, it is being adopted by big organisations like Mozilla, Expedia, Facebook, HP Public Cloud, Prezi, Xero, Ancestry.com, Rackspace, Disney, etc. 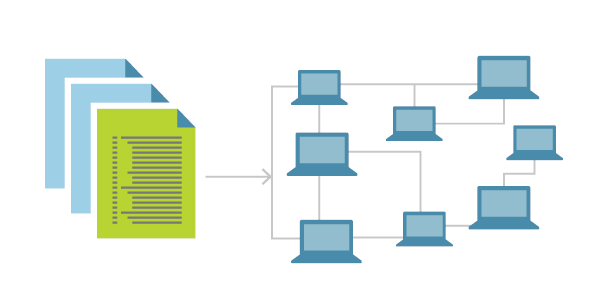 What is Configuration Management and what is its importance? Now let us learn what is Configuration Management. In this approach, assume you have to dispose a software over hundreds of machines. This software can be an operating system or a code or it can be an update of a currently running software. It is possible for you to do this task manually, but what results if you have to complete this assignment overnight due to any important mass event taking place at your organisation next day in which heavy traffic is foreseen. Even if you were prepared to do this by-hand there is a high chance of recurring errors on your big day. In such a case, returning back to the previous stable version, will not be possible to do manually with ease. To resolve this difficulty, Configuration Management was first founded by utilising the tools like Chef, Puppet, etc. Now it is easy to automate infrastructure configuration. All you have to do is to designate the configurations in one centralized server and subsequently, all the nodes will be configured. It provides access to an authoritative historical record of system state for project management and audit objectives. So fundamentally, we need to define the configurations once on the central server and replicate that on several nodes. Configuration Management benefits in implementing the following described tasks in a very structured and gentle way. Deciding which segments to change when conditions change. Repeating an implementation due to the specifications that have grown since the previous implementation. Reverting to a previous version of the component if you have replaced with a new but flawed version. Substituting the wrong component because you couldn’t correctly determine which component was thought to be replaced. There are mainly two ways to maintain your configurations, specifically Push and Pull configurations. In Push Configuration Management, the centralized Server launches/pushes the configurations to the nodes. Dissimilar to Pull Configuration, there are some commands that have to be administered in the centralized server in order to configure the nodes. Push Configuration is practised by tools like Ansible. In Pull Configuration Management, the nodes pick/pull a centralized server systematically for updates. These nodes are dynamically configured so primarily they are pulling configurations from the centralized server. Pull configuration is utilised by tools like Chef, Puppet, etc. Keeping precise, repeatable builds was unmanageable. There were several build failures and tests were regularly running in the wrong circumstances. Deployment and provisioning times could extend from a few days to many weeks. Operations team didn’t have entry to the Cloud or development conditions. Every group adopted its own tool-set, and there was no responsibility on fund or confidence. No one understood how much an application really cost. Safety had no way to audit the software stacks. XYZ was willing for the development. Developers required to deploy their applications immediately. Services needed a solid infrastructure where they could create and deploy in a repeatable way. Security wanted to inspect and audit all stacks and to be ready to track conversions. Everything had to be done in a cost-effective way as well. XYZ noticed the benefits that Cloud as a service offered. Developers had access to patterned resources. It was simpler to handle peak traffic due to the Cloud’s compute-on-demand model; moreover handoffs were reduced. XYZ began creating VPC (Virtual Private Cloud) for a development environment that would imitate the production. The tools that they were previously using were inappropriate. But they discovered that Chef served well with the Cloud and both Linux and Windows background. They employed Chef to build a development setting that correctly matched the production environment. For an application to transfer into the VPC, it had to be reserved and deployed with Chef. From the beginning itself, everything would be secure and would handle the necessary controls for access to Chef and for maintaining system security standards. XYZ’s deployment grew faster and more stable. Application provisioning and deployment, which previously took weeks, took only minutes to finish. All new applications were disposed on the Cloud with Chef. These apps were deployed to all environments in a similar fashion only to be deployed to production. Also, testing happened in each situation, so that the deployments were sure. All infrastructure was operated as code, which hugely increases clarity into any differences that happened. Development, Operations, Security and Finance all were profited from this. Chef is a great model of the next-generation technology and tools required to assist break enterprise pits and present a place for all technological practices to work together. 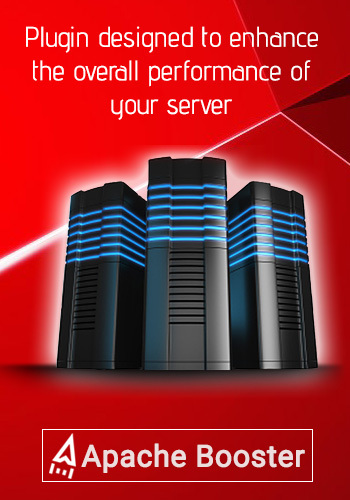 Apachebooster is an advanced cPanel plugin which is tailored to boost the overall server performance of Apache software. The changes one can see before and after installing it are evidently significant. Technology Ansible, automate infrastructure configuration, chef vs puppet, configuration management, what is chef. permalink.